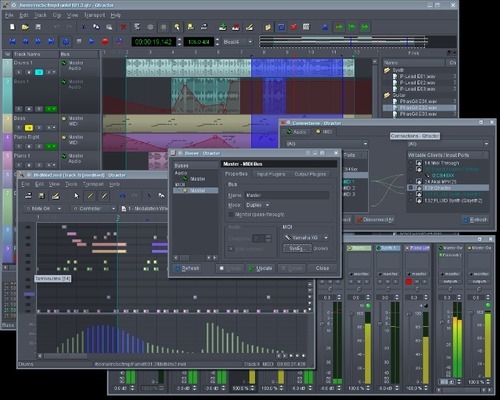 The free multi-track recording and sequencing software Qtractor has released 0.5.11 with many improvements and bugfixes. Adding a track now inserts it after the current one, if any; one can also drag and move a track below the last one in the track list (main view left pane). Extended Edit/Select Mode/Automation: multi-selection mode, cut, copy, paste and delete of current track’s automation curve nodes, now reached implementation ready status. Another old silent bug bites the dust: changing track names were dropping any track gain/volume and panning automation curves when saving the session. A primeval processing bug has been sorted out: aux-sends to audio output buses that just appear to be after the input bus where they’re inserted were being left muted and silent (on a ticket follow-up by Holger Marzen, thanks). Fixed a sure crash bug exposed when processing of aux-send plugins when inserted too early on audio input buses chain (after a ticket report by Holger Marzen, thanks). Allow the build system to include an user specified CFLAGS (patch by Cristian Morales Vega, thanks). Shift/Ctrl keyboard modifiers now set to extend current clip selection while in main track view’s Edit/Select Mode/Range, Rectangle modes. Allow to change the velocities/values of the current selected events which have the exact same onset times and hide beyhond each other on the MIDI clip editor’s pane below the main view piano-roll (ie. the one that represents MIDI event values as a bar chart). Fixed some problematic playback/export muting and annoying cleanup freezing, due on audio tracks with too many clips eg. more than hundred clip splits (hopefully fixes an issue reported by Louigi Verona, thanks). LV2 UI resize feature support/control added. Fixed dedicated MIDI control and MIDI metronome port connection restore conflict (thanks to jhammen catch & patch:). New user preference option added: reverse middle-button role to Shift/Ctrl keyboard state, in special regard to edit-head/tail vs. play-head positioning while on the main track and MIDI clip editor (aka. piano-roll) views.